How Hong Kong’s true rulers in Beijing are trying to eradicate pan-democratic opposition voices. Over 40,000 voters were unregistered after their addresses were found to be false according to Hong Kong Registration and Electoral Office. Numerous voters have been caught declaring a street light, hotel or derelict shop as their residential address in the lead up to August’s Legislative Council elections. The Hong Kong government has also been criticised for its careless and unprofessional scrutiny of voter registrations with a Ming Pao Newspaper investigation revealing that forged voter registration forms were accepted. Following the election, pan-democratic groups such as the Labour Party and the Civic Party lodged complaints over allegations of vote rigging arising from voter registration fraud. Although it is believed that there have been about 400 confirmed instances of voter fraud across Hong Kong, its overall impact on the Legislative Council election’s results is unknown. In an unprecedented move prior to the Hong Kong Legislative Council elections, the Electoral Affairs Commission required all candidates to sign an extra “confirmation form” as part of their nomination. The “confirmation form” sought to declare their understanding of Hong Kong as an inalienable part of China as defined in Hong Kong’s Basic Law. Despite eventually signing the “confirmation form” Edward Leung Tin Kei, a prominent pro-localism activist and protester during the riots of Mong Kok (2016 Fishball Revolution) was disqualified with the Commission doubting the sincerity of his signature due to his social media postings. 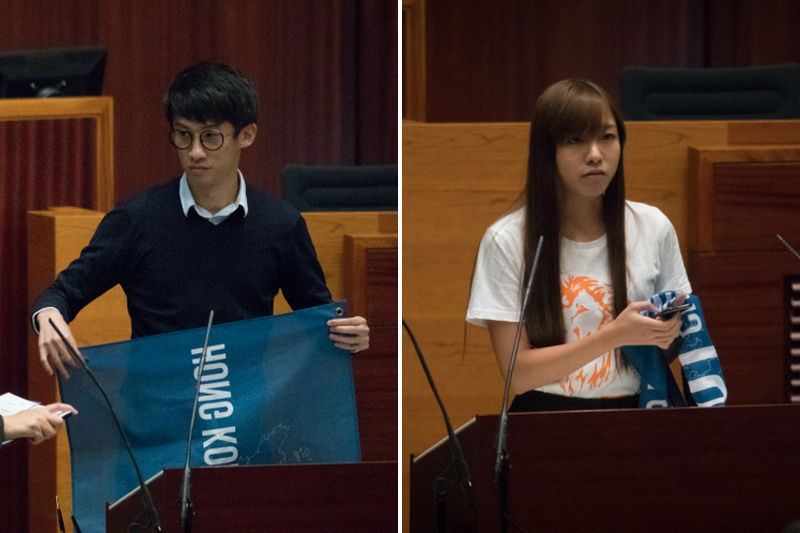 Edward Leung then rallied his supporters in favour of Youngspiration’s Leung Chung Hang and Yau Wai Ching whom would later be disqualified from the Legislative Council in the oath-gate controversy. Chan Ho Tin of the Hong Kong National Party was also barred from contesting the Legislative Council election by the Electoral Affairs Commission as a result of his political views which the government described as being in breach of the Basic Law which stipulates ‘One Country, Two Systems’. The Hong Kong National Party was also denied company registration without an official explanation from the Companies Registry. Political parties have to register as companies in Hong Kong and it is widely believed that the refusal to register the Hong Kong National Party was due to the group’s pro-independence stance. After Youngspiration’s Leung Chung Hang and Yau Wai Ching made international headlines for swearing at China during their oath taking in the Legislative Council, the Chinese government sought to interpret the Basic Law effectively giving it the power to remove any legislator that Beijing believes is not sincere with oaths. The Chinese government’s interpretation of the Basic Law has also effectively stripped the judicial system in Hong Kong of the power to make decisions towards the validity of oaths taken, with Beijing now able to pursue alleged breaches of the “sincerity clause” on all legislators even those whom had their oaths accepted in earlier terms of the Legislative Council. Following unsuccessful appeals in the High Court by the Youngspiration duo against their removal from office, the Hong Kong government has ordered legal challenges on 4 more pan-democratic legislators including Lau Siu Lai, Yiu Chung Yim, Nathan Law Kwun Chung and ‘Long Hair’ Leung Kwok Hung. These 4 legislators have had their oaths accepted by Legislative Council chair Leung Kwan Yin despite their use of their oaths as means of protest prior to the Chinese government’s interpretation on the Basic Law. Recent comments from Hong Kong Chief Executive Leung Chun Ying and Chinese President Xi Jin Ping also confirm the governments’ view that discussion of localism and independence in the Legislative Council would be in violation of the ‘One Country, Two Systems’ principle. During the last term of the Legislative Council, many government bills struggled to fast receive passage due to filibustering by opposition pan-democratic legislators in trying to embarrass and delay the pro-Beijing/Hong Kong government camp. With key bills such as the Hong Kong government’s much desired but defeated “fake democracy” 2017 Electoral Reform requiring a special majority, the pro-Beijing camp lacked the numbers for its passage. However with opposition pan-democratic gains at the 2016 Legislative Council election with wins from several new post-Umbrella Revolution candidates, the balance of power for key bills remained outside the immediate control of the pro-Beijing and government. The disqualification of Leung Chung Hang and Yau Wai Ching and soon to be removal of an extra 4 pan-democratic legislators for breaches of the interpretation of the Basic Law’s “sincerity” clause about oath taking, the pro-Beijing camp is in a strong position to get a majority from the by-elections. Prior to the disqualification of the Youngspiration duo the pan-democratic camp held 18 direct seats compared to the 17 held by the pro-Beijing camp. With 6 seats soon to have a re-run of the Legislative Council election, the pro-Beijing camp just needs to win 2 to get the majority. Any camp with 18 directly elected legislators in the geographical constituencies can reject motions, bills and amendments to government bills proposed by fellow legislators. The public reaction to the the Beijing’s interpretation of the Basic Law and the Hong Kong government’s pursuit of pan-democratic legislators for breaches of the oath taking “sincerity clause” has been mixed. Many in Hong Kong agree that Leung Chung Hang and Yau Wai Ching should not be accepted due to their use of offensive language in their oaths. However the sudden and strong intervention of the Chinese government into the oath-gate controversy has sparked fears of a Communist government dictatorship imposing its authority over Hong Kong. With Beijing’s ruling superseding the power of Hong Kong’s judicial system to decide on the validity of oaths and eligibility to stay as a legislator, demonstrations and riots have broken out around government offices in protest against the Chinese government. Tensions in the Hong Kong community have also flared with some pro-Beijing citizens groups in open “warfare” against pro-democracy and pro-Independence groups. Traditionally protests and demonstrations would only be directed against the government but now citizens are starting to turn on each other based on their political differences. The Hong Kong government is believed to be using the growing political unrest as an excuse to re-introduce the controversial ‘Article 23’ security and anti-subversion laws that many fear will give the government un-vetted powers to infringe on civil liberties. The pro-Beijing failed to have the Legislative Council pass security law ‘Article 23’ in 2003 due to public outrage and opposition from pan-democratic legislators. However with the pro-Beijing camp likely to win its special majority and growing political divisions, the likelihood of ‘Article 23’ being enacted grows by the day. Hong Kong may have voted not to give the pro-Beijing camp an ultimate majority but the Chinese government always has the final say. Oath-gate might well just be a part of Beijing’s schemes to fully reunify Hong Kong to the mainland. Say goodbye to checks and balances in Hong Kong and welcome (back) to China.